Here is my attempt at a One Layer card. Definitely a struggle to not reach for extra paper, ribbons or embellishments! Still, I like the way it turned out, letting the stamps tell a story. 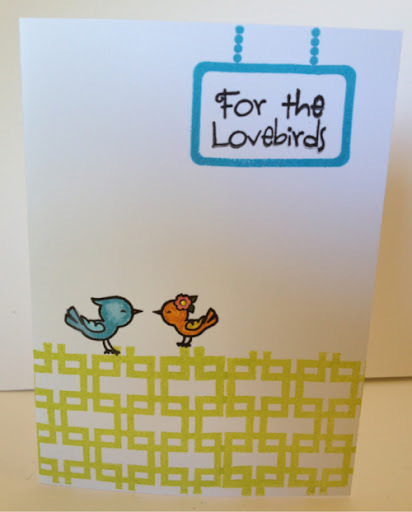 The birdies, sign and sentiment are from The Crafters Meow. The "fence" is from a stamp set given to me by a friend, I believe it's a Teresa Collins stamp. I used Distress markers to color in the love birds and a drop of "Liquid Pearls" paint in Daffodil in the center of the chickies' flower. Hi there Adrienne! I love this, and really hope that you will be able to join us again this week at Word Art Wednesday. We'd LOVE to have you play along with us and hope to see your pretty art linked up this week. Great card. Yep, one layer cards are not easy to make when you are use to stacking the stuff on. You did a great job and thanks for joining us at The Perfect Sentiment. It's marvelous, Adrienne, and doesn't look like a struggle at all ! :-D Don't forget, if you've done all four of our challenges at Perfect Sentiments by October 30, you need to take the extra step and link to the Grand Prize page also in order to be in the Grand Prize draw. Thanks for playing along with us and helping us celebrate our First birthday!